The idea for this post came to me after reading the comment of Esthon Wood: “do you have any idea on how to save the state of the WebView? 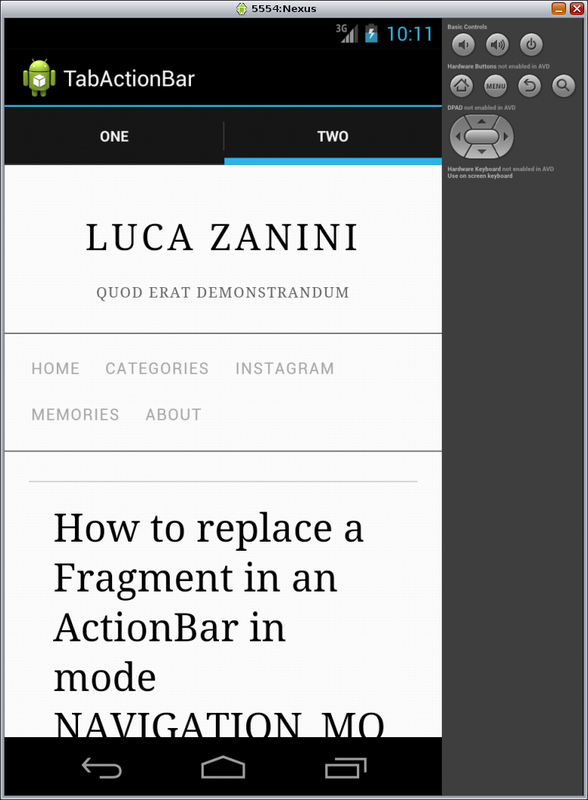 I mean, the webview refreshes everytime I tap on the tab.” in the post Tab Layout in Android with ActionBar and Fragment. 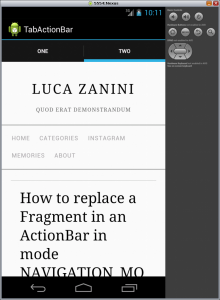 As a starting point I suppose that you have properly configured the example explained in Tab Layout in Android with ActionBar and Fragment. how to create method onKeyDown in this Fragment? I’m a bit new to android. I nliked your example and it work really Good – Thank you. Could you please advise how do I add a progress bar to it? Friend, I am using your article as reference when I return in the webview Tab 2 takes about two seconds to reload, there is a way to solve this case? Thanks!! where I use “show” and “hide” instead of “attach” and “detach” at the lines 10 and 18.
i used your idea. but when we rotate the phone or orientation changes , the links start opening in a new browser. how can we prevent that ?? I don’t have the issue you said. The row 25 in Tab2Fragment.java should prevent that. I think you don’t need but you can explicitly handle the page navigation as explained here.